Fr. Bill Klock, a Reformed Episcopal priest in Portland, Oregon, saw all the "stacks" of Bibles being posted and decided to share his own. He posted an annotated list on his blog, and e-mailed me about it as well. Since several of my favorites are included, I'm posting the photo and annotations here. Be sure to visit Fr. 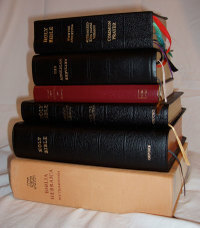 Klock's blog to read the original post, and to check out his piece on reading the Bible through in a year, which includes a variety of good resources. Here's Fr. Klock's description of the editions in the picture:From top to bottom: 1) My beloved 1928BCP/KJV "Combo." The Prayer Book Society printed these years ago and I didn't get one. When they handed over the rights to the Anglican Catholic Church, I forked over the major dough for one of the new leather copies...then waited, and waited, and waited...for over a year. But it was worth the wait. The printing isn't the best ever and the leather cover is more durable and functional than beautiful, but this is my favourite book of the thousands in my library. It goes with me everywhere and gets used every single day. This is my "reading" Bible and my personal use BCP. One big unexpected plus I found with this Bible is that it's a photographic reprint of the standard Oxford edition, so the pages exactly match my wide-margin primary study Bible (#5). 2) The Anglican Breviary was introduced to me by a good friend who also happens to be a priest. It's essentially a translation into Cranmerian English of the Roman Breviary or Divine Office as it existed in 1911. Calling it "Anglican" is a bit misleading as it's only Anglican in that it uses the collects from the BCP and the Coverdale Psalter and follows more or less the traditional BCP calendar – the rest is Roman. This is the collected prayer tradition of Western Christendom. It continued to evolve in the Roman Church beyond the time of the Reformation and thus I don't always agree with it's doctrine or the "saints" it commemorates, but neither is it something a Protestant can or ought to ignore. I wish I had the time to pray all eight offices every day, but being in bivocational ministry and having a family, that's just not happening anytime soon. I generally use the Breviary to supplement Morning and Evening Prayer from the 1928 BCP. This edition was printed privately by a California attorney and Anglo-Catholic. The printing is in both red and black and is absolutely beautiful – sometimes I can't help but sit and turn the pages and admire how classy it is. The cover is some kind of "leatherette" and very stiff. It looks great, but keeps the book from lying open except in the very middle, and is only in such good condition because this book rarely leaves my desk. 3) The Greek New Testament (4th edition, UBS Text) was a gift that the Canadian Bible Society gave to all seminary students taking Greek. Somehow I've maintained this in reasonably good condition. They didn't give away the spendy editions with "flex" or leather covers. I don't generally do my daily Bible reading in Greek – I reserve that for more serious in-depth study and sermon prep. One of these days I'd like to replace this with one of Hendrickson's wide-margin GNT's so that I can write notes next to the text. 4) The Oxford Revised Standard Version Bible (with the Apocrypha) is my modern-language Bible and the one that I've usually preached from. I like using the King James personally, but have found that I need to preach from a modern text. The RSV has it's problems, but overall it's a pretty good translation into modern, formal English and the fact that it still uses "Thee" and "Thou" in reference to God means it fits in well with the liturgy. This is a mid-range quality leather copy that is no longer available. Ever since the New Revised Standard Version (yuck!) came out the RSV has been disappearing, and I think this edition was only printed to celebrate the RSV's fiftieth anniversary. The English Standard Version is a conservative revision of the RSV text and I expect to be switching to the ESV in my new parish, but they really need to release an Anglican edition that uses Thee/Thou and includes the Apocrypha! 5) I don't generally like "study Bibles" because the notes, if and when they're doctrinally sound, usually tell me things I already know and tend to be absent when I really do have a question about a passage. My solution has been to make my own. Number 5 is Oxford's Wide-margin King James Reference Bible in calfskin or as I sometimes call it: The Holy Bible: Ten Pound Version. This is the mammoth of Bible's and is only smaller than Ye Olde Humongous Family Bible. I went back and forth between Oxford's edition and the equivalent printed by Cambridge (the Crème de la Crème of Bible publishers). Cambridge's includes a dictionary and concordance, but I like Oxford's thicker paper and stiffer cover – not to mention that the two high-end Cambridge Bibles I've owned fell apart within two years. I love this Bible because I can write all sorts of notes, references, glosses, alternate translations, and definitions in all four directions around the text. As another blogger puts it, "The wide-margin Bible is the thinking man's study Bible." I think he's right. If you're going to do serious Bible study a wide-margin Bible is a must-have. 6) Finally, at the bottom of the stack, but the most worn off all, is my Biblia Hebraica Stuttgartensia. I bought the smaller version of the same Hebrew Bible my first year in seminary and knew that it would by my favourite of all. If you know me, you know that I'm just an Old Testament lovin' guy. (Yes, my Sephardic roots are beginning to show.) As much as I love the New Covenant by which I've been redeemed in Christ Jesus, I love the OT too. Fact is, you can't really understand the New until you've really studied the Old. You can never appreciate the grace that mercifully saves you until you first understand the righteous Law by which we all stand condemned. I loved studying the Old Testament and the only way to really do so is in Hebrew. My old cheapo (relatively speaking) student edition wore out years ago and was too small anyway, so I replaced it with the full-size (with a matching price tag) edition and love it. Like my GNT, this is part of all serious Bible study. If you're planning to purchase a copy, do yourself a favour and do what I did: buy the full-size edition. Reading tiny Hebrew script is just plain hard on the eyes. The German Bible Society cover is durable, but not very attractive. If or when I someday wear it out, I plan to send this off to have it rebound in leather. Thanks for sharing your collection, Fr. Klock! I've eyed the KJV/BCP combination for awhile now, and the Anglican Breviary is a truly magnificent publication (which I wish had been bound in calf or goat). I've often wished that a publisher of an English translation would adopt the small hardback format of the UBS Greek NT, which is so handy and usable.